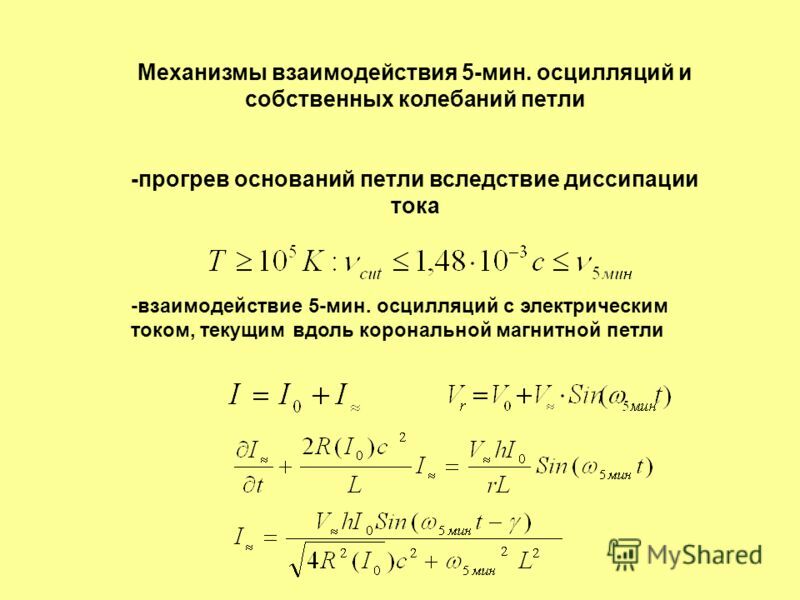 Презентация на тему: "Parametric resonance in microwave radio emission of coronal magnetic loops V.V. ZAITSEV Institute of Applied Physics, Russian Academy of Sciences Nizhny.". Скачать бесплатно и без регистрации. 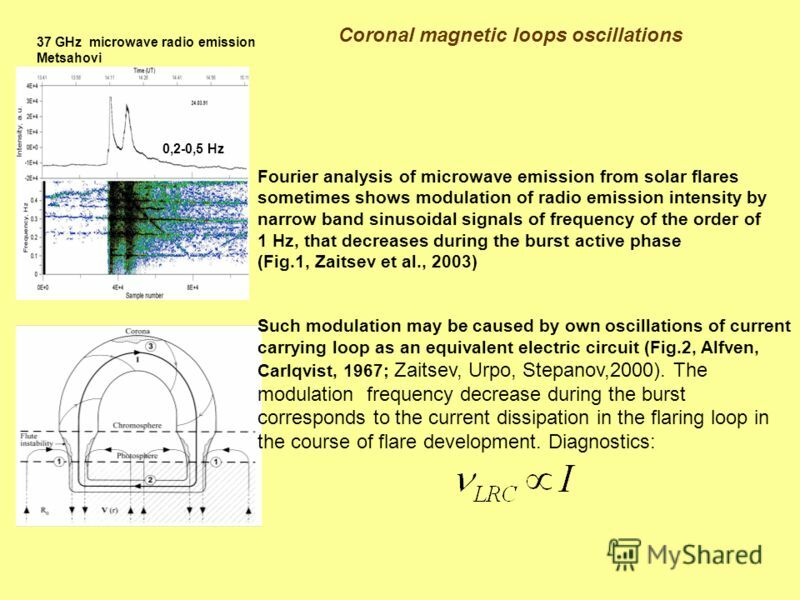 1 Parametric resonance in microwave radio emission of coronal magnetic loops V.V. ZAITSEV Institute of Applied Physics, Russian Academy of Sciences Nizhny Novgorod, Russia A.G. Kislyakov, V.V. Zaitsev, A.V. 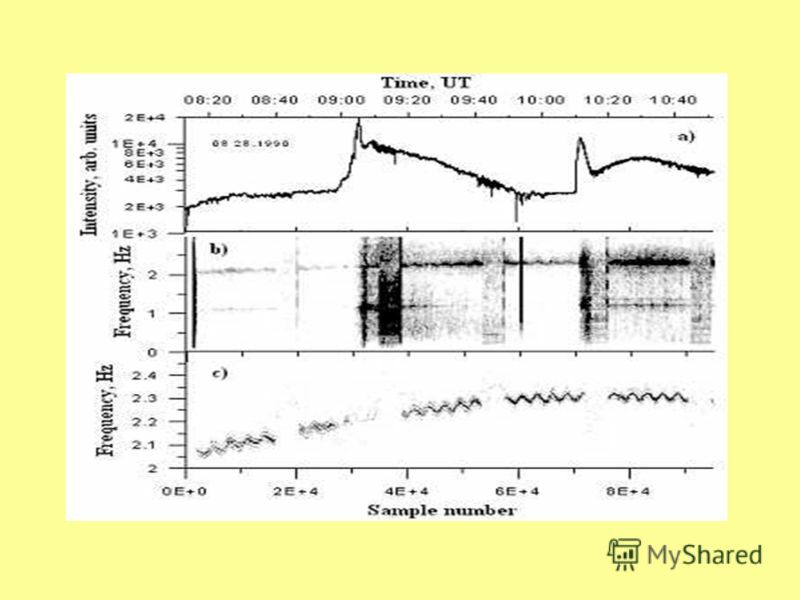 Stepanov, S. Urpo, On the possible connection between photospheric 5-min oscillations and solar flare microwave emission, Solar Physics, 2006, vol. 233, pp V.V. 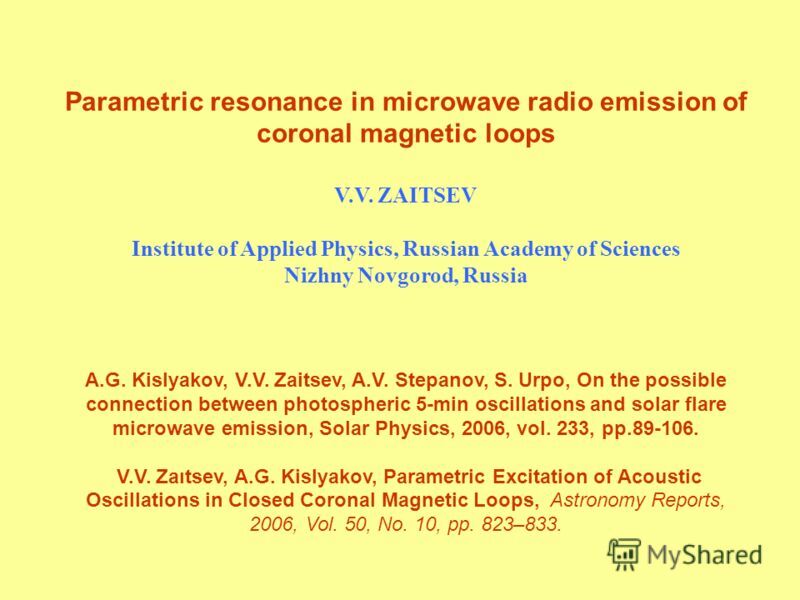 Zaıtsev, A.G. Kislyakov, Parametric Excitation of Acoustic Oscillations in Closed Coronal Magnetic Loops, Astronomy Reports, 2006, Vol. 50, No. 10, pp. 823–833. 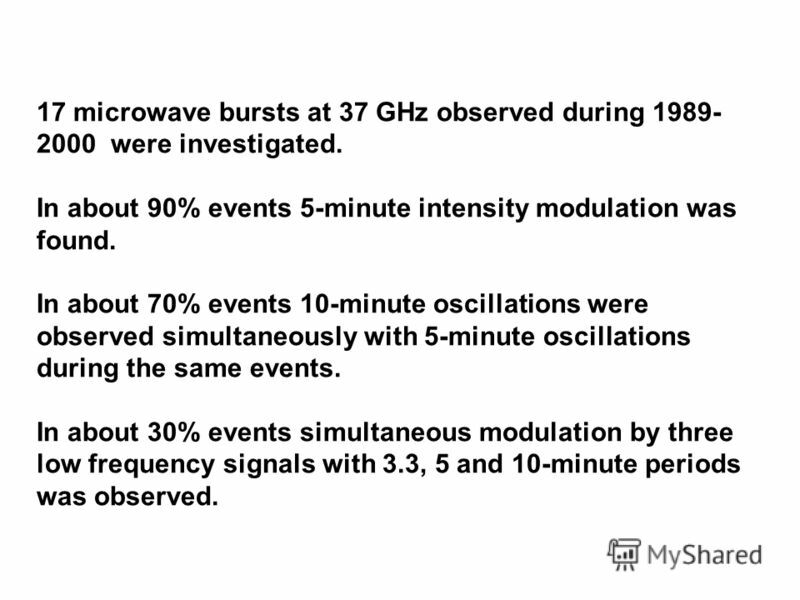 7 17 microwave bursts at 37 GHz observed during were investigated. In about 90% events 5-minute intensity modulation was found. 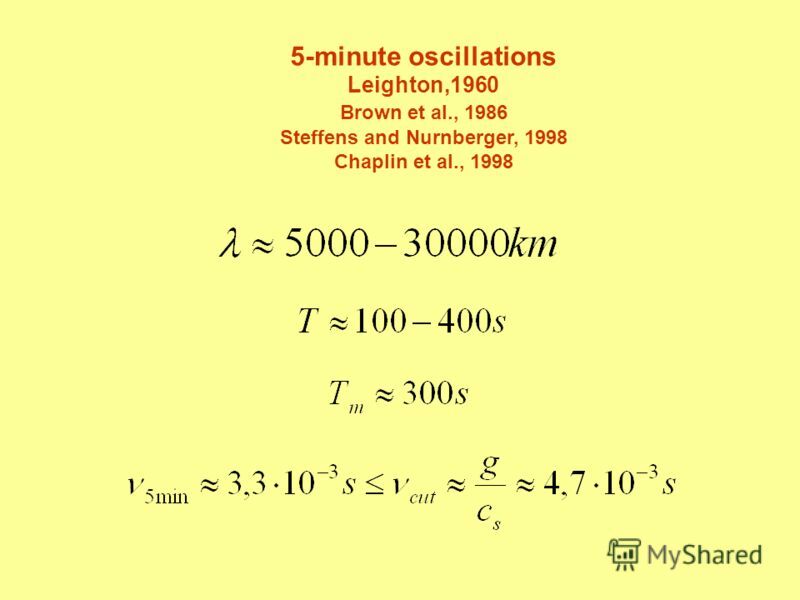 In about 70% events 10-minute oscillations were observed simultaneously with 5-minute oscillations during the same events. In about 30% events simultaneous modulation by three low frequency signals with 3.3, 5 and 10-minute periods was observed. 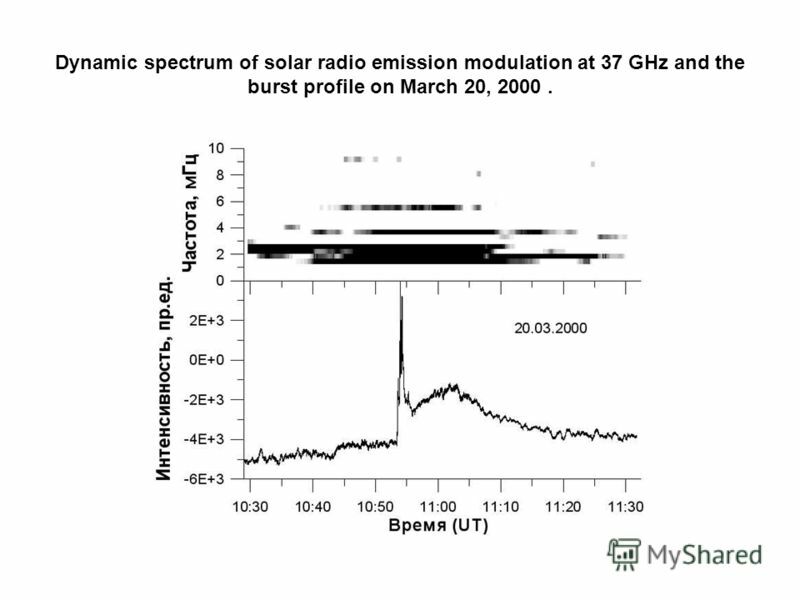 8 Dynamic spectrum of solar radio emission modulation at 37 GHz and the burst profile on March 20, 2000. 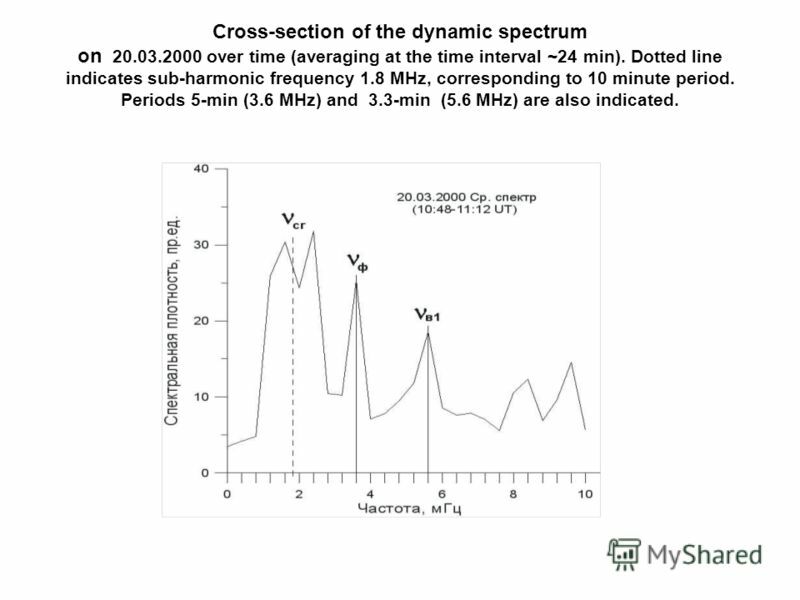 9 Cross-section of the dynamic spectrum on over time (averaging at the time interval ~24 min). 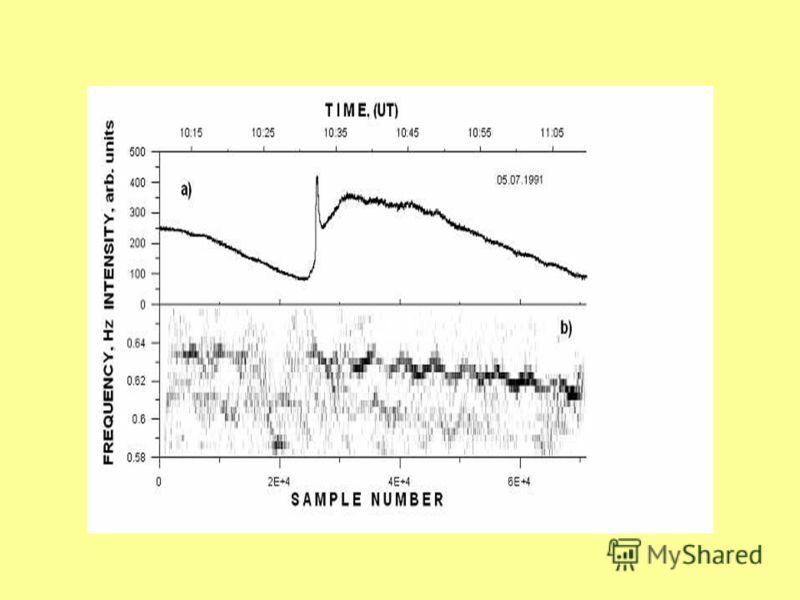 Dotted line indicates sub-harmonic frequency 1.8 MHz, corresponding to 10 minute period. Periods 5-min (3.6 MHz) and 3.3-min (5.6 MHz) are also indicated. 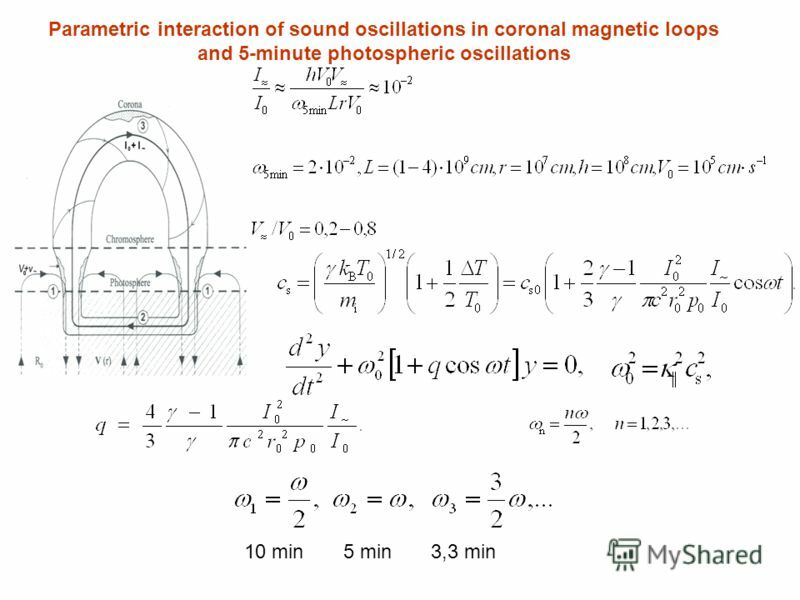 11 Under the influence of 5-minute oscillations of the photospheric convection velocities on the footpoints of the coronal magnetic loop the effect of parametric resonance of 5- minute velocity oscillations in the solar photosphere and sound oscillations in coronal magnetic loops is possible. Such effect demonstrates itself by simultaneous excitation of 10, 5 and 3- minute period oscillations in coronal magnetic loop. 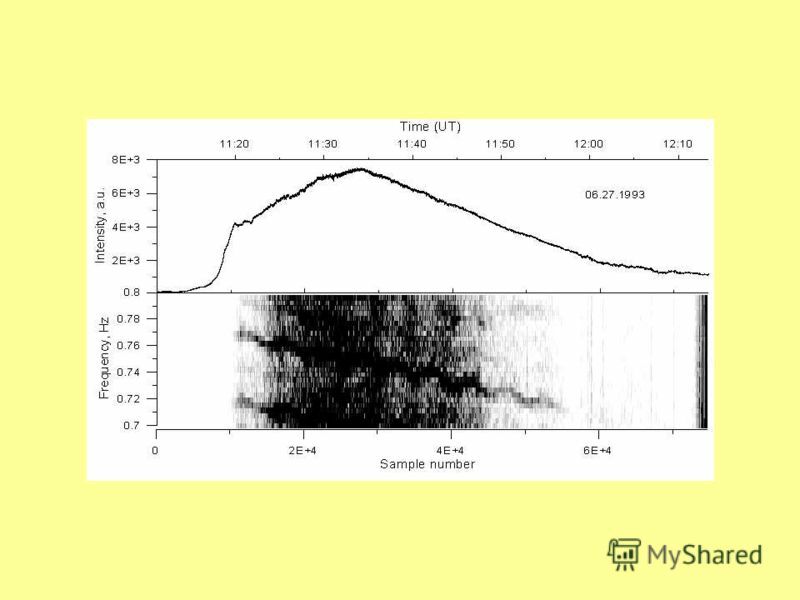 These periods correspond to the sub-harmonic, pumping-up frequency, and first upper frequency of parametric resonance. 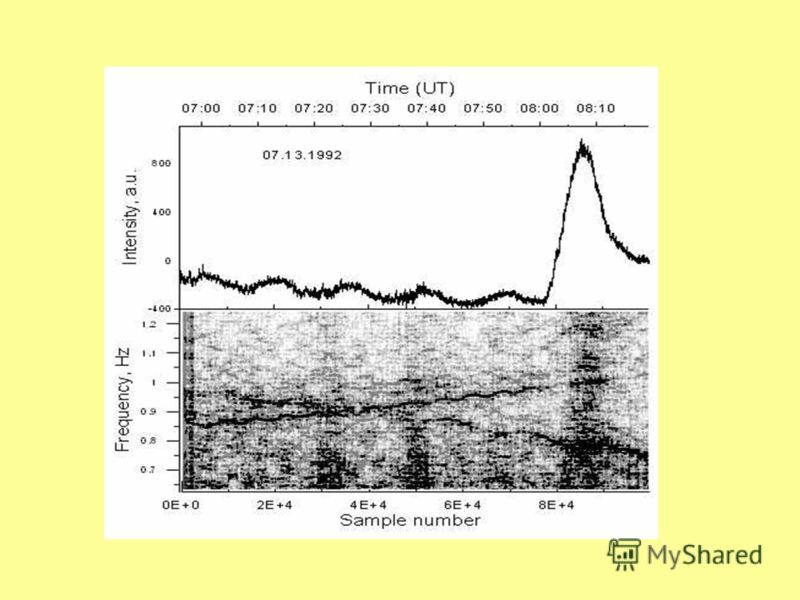 Since 5-minute oscillations cannot directly penetrate into the corona, the parametric resonance may work as an effective channel for transfer the energy of photospheric oscillations to the upper layers of the solar atmosphere. 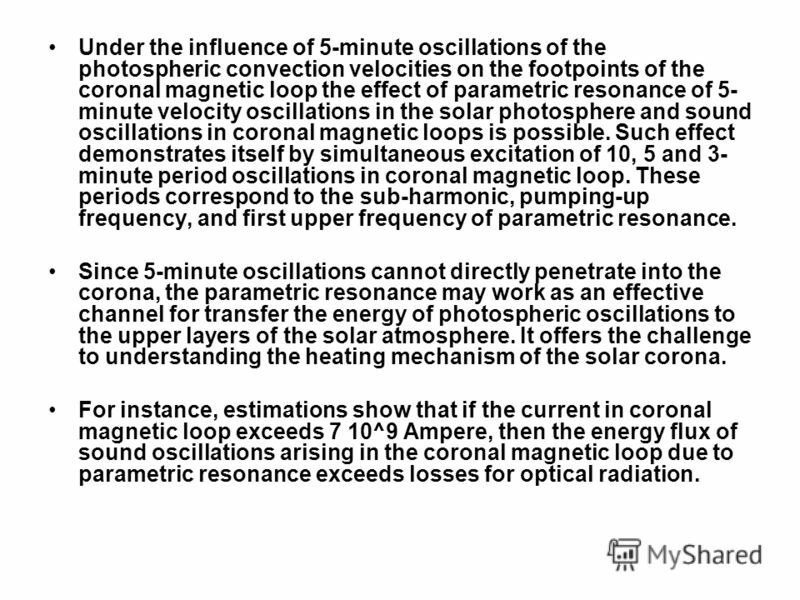 It offers the challenge to understanding the heating mechanism of the solar corona. For instance, estimations show that if the current in coronal magnetic loop exceeds 7 10^9 Ampere, then the energy flux of sound oscillations arising in the coronal magnetic loop due to parametric resonance exceeds losses for optical radiation. 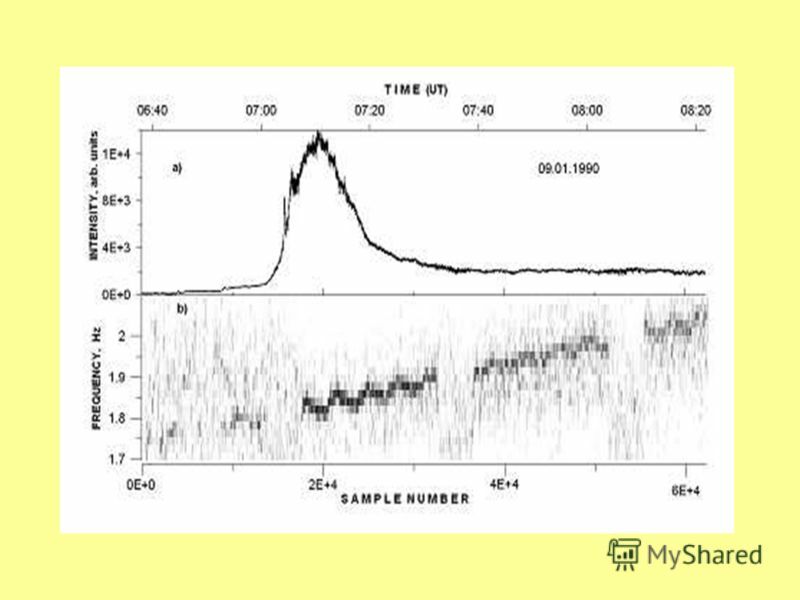 Quasi-phase matching transient SRS generation Victor G. Bespalov Russian Research Center "S. I. Vavilov State Optical Institute" Nikolai S. Makarov Saint-Petersburg. S17-1 NAS122, Section 17, August 2005 Copyright 2005 MSC.Software Corporation SECTION 17 ENFORCED MOTION LARGE MASS METHOD. RLC circuit. An RLC circuit (or LCR circuit) is an electrical circuit consisting of a resistor, an inductor, and a capacitor, connected in series or in. The Pulse Generator for the Supersonic Flow Structure Control ГЕНЕРАТОР ИМПУЛЬСОВ ДЛЯ УПРАВЛЕНИЯ СТРУКТУРОЙ СВЕРХЗВУКОВОГО ПОТОКА Khristianovich Institute. 7/23/2015 1:10:56 AM Just a Pass-time Show for displaying on the monitor of an idling Computer!!! 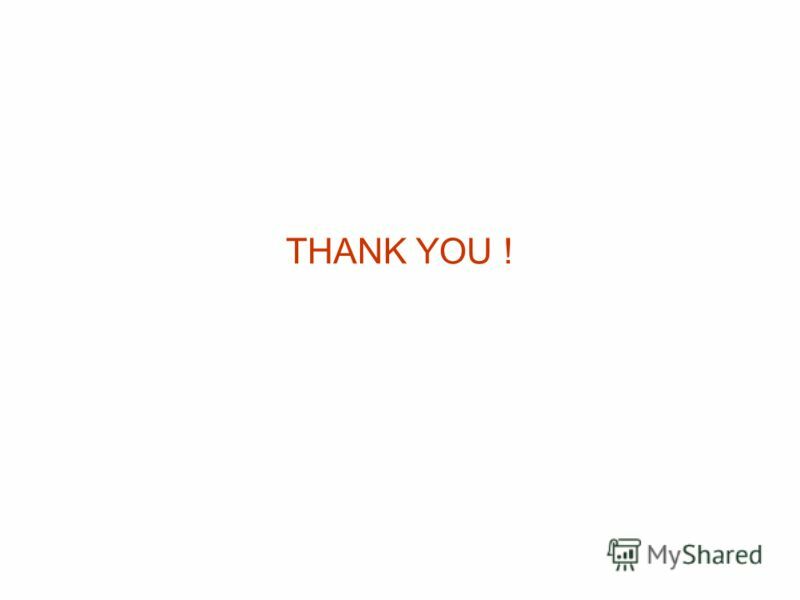 A Slide Show Simply Click once on the Slideshow Icon. 1 On A Laboratory, Magnetic Resonance Experimental Set up This is an Animated feature Viewable ONLY with the MS PowerPoint XP Version. Other versions. S8-1 NAS122, Section 8, August 2005 Copyright 2005 MSC.Software Corporation SECTION 8 RESPONSE METHOD. What is radio? Radio is the transmission of signals by modulation of electromagnetic waves with frequencies below those of visible light. Electromagnetic. 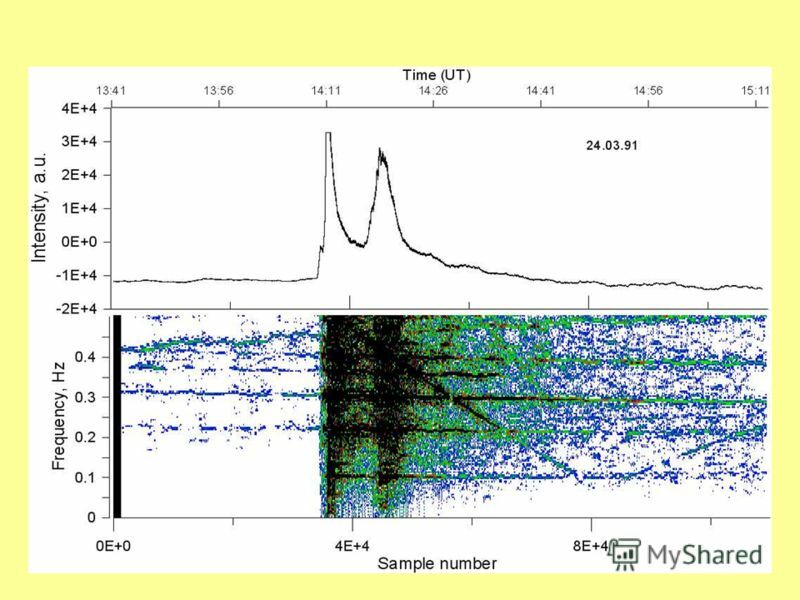 Plasma populations in the tail of induced magnetosphere O. Vaisberg Space Research Institute (IKI), Moscow, Russia, Talk outlay Mars missions studying. Ya. Karlik, Kamchatka Hydro-Physics Inst. V. Svet, Acoustic Inst., Moscow Converted Hydro-Acoustic Array MG-10M as Basic Module for a Deep-Water Nu-Telescope. 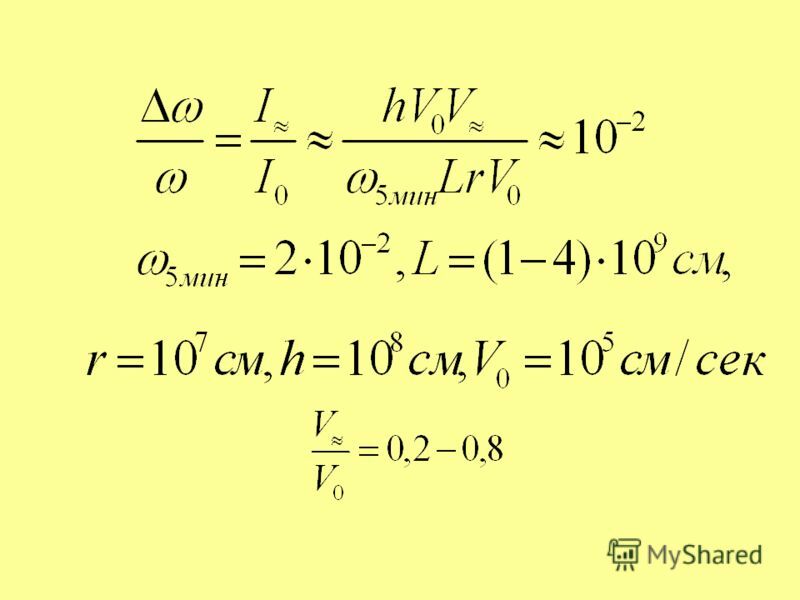 Vortex lattice in presence of weak periodic pinning potential W. V. Pogosov and V. V. Moshchalkov Laboratorium voor Vaste-Stoffysica en Magnetisme, K.
7/23/2015 12:59:31 AMRefresher course in Chemistry; Sept.20-Oct.12, 2007 1 Magnetic Resonance Phenomenon is a manifestation due to the presence of INTRINSIC. Change in the weather and climate in the world. Changing weather and climate are variations in the Earth's climate as a whole or of its separate regions. Theoretical investigation of microstrip transmission lines and resonators on artificial magnetic media I. A. Kolmakov, IEEE member St.-Petersburg Electrotecnical. 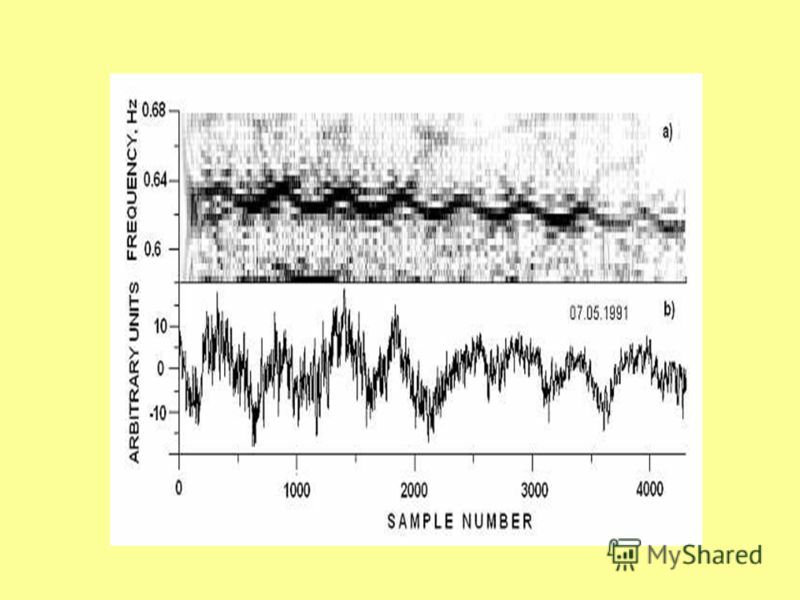 Time-Series Analysis and Forecasting – Part II Lecture on the 5 th of October. Producing Electricity Мозговенко Ольга Петровна Учитель английского языка ЦО 1828 «Сабурово» Москва.